A local family owned locksmith business based near Banstead, run by master locksmith and door repairs expert John Brewer. It is important when trying to find a locksmith in Banstead that you use both a local business and a qualified locksmith to ensure you are getting the best locksmith service at the most reasonable price. 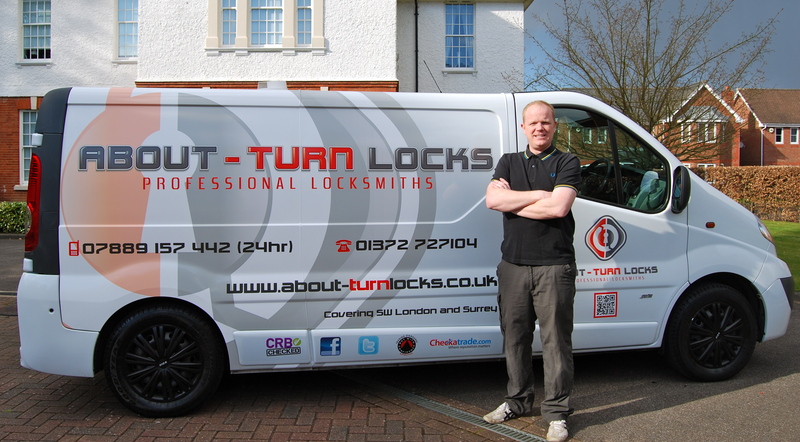 John Brewer at About Turn Locks has been serving Banstead for over ten years and is now considered one of the leading locksmiths in the area. Using a local locksmith business covering Banstead ensures you get peace of mind that if anything should go wrong we are only a stones throw away to come and rectify any problems. National locksmith chains rarely send out the same engineer and are less likely to help you out one they have had your money. Our reputation is important to us and John will go above and beyond to help our locksmith customers in Banstead. As well as the traditional locksmith services that you would expect, we also offer door repair services for uPVC and composite doors in the Banstead area. If your uPVC door lock is beginning to feel stiff and tricky to lock or has jammed completely, our master locksmith in Surrey can repair and replace the multipoint locking system and re-adjust hinges and keeps to restore your door back to full working order. With uPVC doors now accounting for the majority of doors in the Banstead area it goes without saying that this is our bread and butter work. For more information on our services and the areas we cover or just to pick our brains, please feel free to contact John via the details above and he will do his best to help you. We welcome all reviews form our customers in Banstead and appreciate any feedback or suggestion you wish to add. We publish all reviews both good and bad. 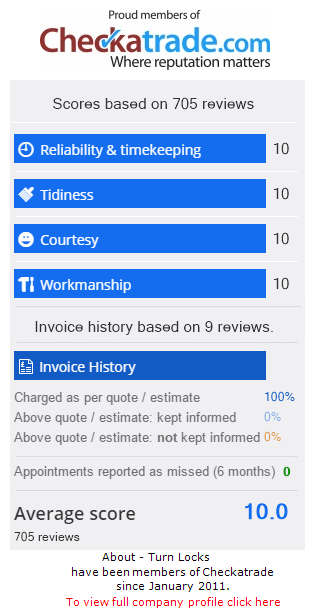 You can view more testimonials on our Checkatrade webpage vouching for the excellent service we provide in Banstead. Other areas we cover: Ashtead, Epsom, Esher and all surrounding areas. Always leave a spare key with a neighbour rather than try to hide it under a flowerpot or a doormat, as these are the first places that thieves will look. For the same reason don’t be tempted to hang a spare key inside the letterbox. Taking basic precautions such as remembering to close all windows and locking back doors before leaving the house are incredibly important as thieves will take any opportunity left available to them. Hinge bolts can be a relatively inexpensive solution to strengthening a vulnerable door. Remember to fit appropriate locks to the top and bottom of patio doors if they don’t already have a multi locking system. If living in a flat or an apartment never open the main entrance door to strangers or hold it open for people who appear to be entering just as you are leaving. Gravel is another cheap security measure. The crunching noise it makes can make it very difficult for thieves to sneak around the sides of the house. Beware of bogus callers who can use guises such as desperately needing to use a phone or a bathroom. This is when viewfinders and door chains can be very helpful as you can see the caller without having to open the door fully. It’s best to keep your front and back doors locked even when at home.Have the back door locked when answering the front door to a strange caller for they might have an accomplice who’ll try to sneak in whilst you’re being distracted. If your doors are made from uPVC, they should have at least 5 points of locking up the side of the door, or 2-4 hook bolts with a latch and deadbolt. Change all locks when moving into a new house or apartment.Do not leave spare keys in obvious places like under flowers pots or welcome mats. Do not have identifying tags on your key ring that provide thieves with personal information such as your name and address. Look for specialized keys that require your authorization to make copies and can only be duplicated by a professional locksmith. Do not leave gaps around doors and frames that would make doors vulnerable to prying. Make sure back doors and the door that connects your garage to you home are solid and secured with high security deadbolt locks. DON’T leave ladders lying around. Keep your shed/outbuilding locked. Burglars will use YOUR tools to gain access to YOUR house. Don’t leave curtains & blinds drawn during the day – they will attract burglars. Ask a neighbour to remove any post or newspapers left showing in your letterbox. UPVC lock? these can provide great security, if you deadlock them at all times, otherwise this can be a possible entry point.If your door hinges are facing outwards reset them inwards, so burglars cannot knock the pins out to gain entry. Sash windows should be fitted with Sash Bolts, or if not used permanently secured from the inside. French (Double leaf) outward opening doors should be fitted with additional key operated security bolts, at the top and bottom of the last closing door. Ideally, but not essential, both opening doors should be fitted with security bolts. Letterbox restrictors or letter cages will prevent anyone from reaching through to release locking devices. Do not leave valuables such as laptops, games consoles, jewelry etc; in sight, through doors and windows. Alarms are always a good investment, and can be relatively cheep to install. It is not true that by having an alarm, a potential intruder will think you have valuables worth stealing. Even a ‘dummy bell box’ can be enough to make them choose another target.